In Sri Lanka, over 3 million people use public transport every day. Many destinations in the country are connected only via public transportation. Being the most economically viable option, buses and trains are the main source of transport for women and girls as well. They use public transport to assist them in their day to day routines to travel to school, work, groceries, marketing and back home.But unfortunately, public transport is not the safest option for women and girls. Research reveals that a staggering 90% of women have been subjected to sexual harassment in local buses and trains. Acts such as deliberate unsolicited touching, excessive closeness, rubbing body-parts, commonly take place in daily commute. But the harsh reality is, only 4% of those victims sought police assistance. Although Sec 345 of the Penal Code, Sexual harassment constitutes “harassment of a sexual nature using assault, criminal force, or words or actions which causes annoyance to the person being harassed”, victims of sexual harassment in public transport have very rarely spoken out against such violations fearing repercussions and further humiliation. Predators often take advantage of these vulnerabilities faced by women and girls. Women In Need, an organization dedicated to addressing gender based violence in Sri Lanka has created a mobile app called 2six4, giving women, girls and bystanders the ability to inform selected contacts immediately when in need of help. It also connects you to the nearest police stations and the Police Women and Children’s Desk, at the press of a button. 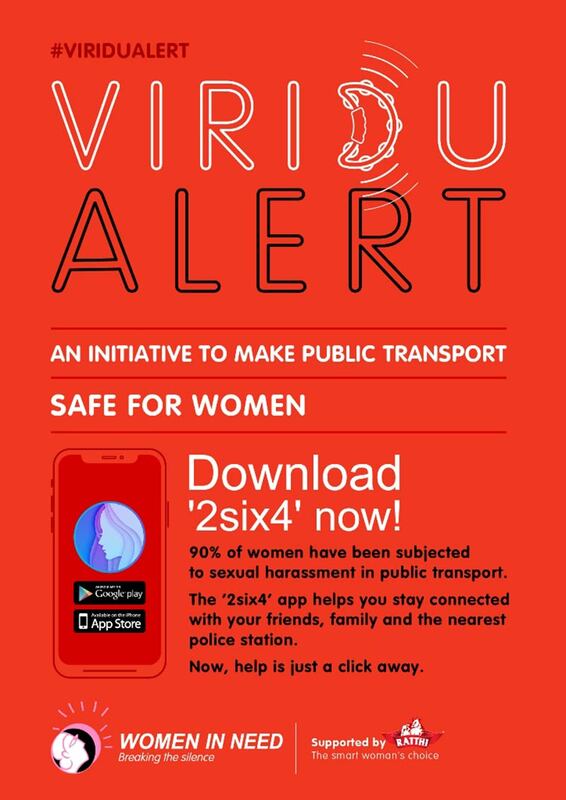 To create awareness about the app and fight sexual harassment in public transport, WIN found the solution inside public transport itself – ‘Viridu Alert’. WIN collaborated with a famous local Viridu singer, SurangaKavee and created a song that carried a strong message for predators lurking in buses and trains. It also encouraged bystanders to come forward and help. During their performance, Suranga and his pupils informed passengers about the ’2six4′ app that women can use in an emergency situation. For a change, Viridu Singers performed not just to earn a living but also for a good cause. Using Viridu as a medium WIN spread awareness about the issue and also gave people a solution, at their fingertips. The ‘2six4’app is available in three languages – English, Sinhala and Tamil. It is Sri Lanka’s first ever gender-based violence reporting app, available for download on the App Store and Google Play. It’s time we all rise against sexual harassment in public transport, a cowardly act which is a violation of human rights. We urgently need a strong policy to address the issue of sexual harassment of women and girls in public transport, to make public transport safe for all citizens of Sri Lanka. WIN, supported by Ratthi, initiated this campaign along with a petition to request the Government of Sri Lanka to take steps to keep our mothers, sisters, daughters and friends safe in public transport, treating them with the respect and dignity they deserve.